Do you have questions about what qualifies as a service animal? Where you can take your service animal? Where can you take an assistance or companion animal? Service Animal – This is defined by federal and Colorado law as a dog (or miniature horse) that has been individually trained to perform a specific task or service for a person with a disability. A service animal is considered an extension of a person with a disability and is allowed in any place that is open to the public. A service dog can only be excluded from a business or public place if it is out of control or not housebroken. 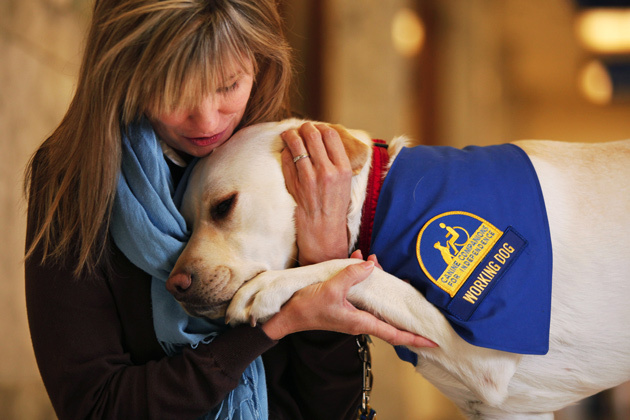 Companion or Assistance Animal – Companion and assistance animals are a product of federal and state laws regarding housing and are defined as animals that help a person with a disability alleviate one or more symptoms of their disability while in their home. This can include a dog that barks when the doorbell rings to assist a person who has a hearing impairment or a cat that provides a person with bipolar disorder a reason to get up in the morning, take her medicine and go to work. Only people with disabilities are entitled to have companion animals and even then, companion animals are only allowed in a person’s home. Business owners and other places of public accommodation are not required to allow companion or assistance animals into their businesses. The fact sheets and publications below provide useful information about what qualifies as a service animal and where service animals can be taken. Disability Law Colorado was contacted by a person with a disability who wished to have his companion animal live with him. Many people with disabilities use a service animal in order to fully participate in everyday life.